If one of your employees is injured; your property damaged; or some of your most valuable equipment broken down, your costs can be significant. This is one reason among many why, as a garage or repair shop owner, you need protection, which insurance provides. At TrustStar Insurance Services we have a complete garage insurance program, which is flexible and also which we tailor to individual clients. We’ve insured garages and repair shops in Universal City and in communities throughout Central Texas for years, and also we have access to many markets. For this reason, we’ll provide to you the best possible garage insurance. We inspect locations for free and also we offer free guidance. Our goal is to reduce costs, and if we meet our goal then you and your business will be secure under all circumstances. Garage insurance is a lot like standard business insurance; it has many of the same coverages and also protects in similar ways. However, there are coverages available for garage insurance policies and plans that are not available for standard business insurance solutions. 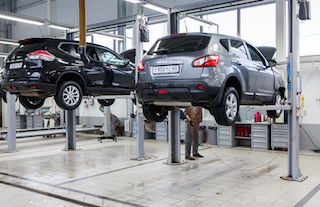 Body shop insurance, Mechanics ENO, and muffler shop insurance are among these coverages, and we offer these and other coverages. We’ll find out if you’re covered on a primary basis, and also we’ll help you select coverages that you need. From workers compensation and general liability to a business owners policy (BOP) and garagekeepers legal liability, there are no coverages that you’ll need that we don’t offer. We’ll ensure that any policy or plan that you purchase is fitting, and also we’ll provide you with OSHA guidance if necessary. You may be able to save time and money as a client of ours if you take advantage of benefits and discounts for which you may be eligible. Talk with an agent to learn about these benefits and discounts. We take a hands-on and detailed approach to serving clients, and this means that we thoroughly assess the clients’ needs through one-on-one consultations, risk analyses, and on-site assessments. Once we know and understand clients’ needs, we shop on the clients’ behalves for the right coverages. At the points that the right coverages are identified, we create the best possible solutions. In order to ensure that coverages are always current and also that clients’ rates are always competitive, we regularly review policies and plans that we a write. We include clients in review processes whenever possible, and as a result, clients are able to understand their purchases and also be aware of needs for changes to coverages. 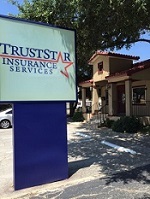 At TrustStar Insurance Services we’re proud to provide garage insurance in Universal City, San Antonio, New Braunfels, Alamo Heights, Schertz, and Helotes, TX. We also serve other areas in the state.